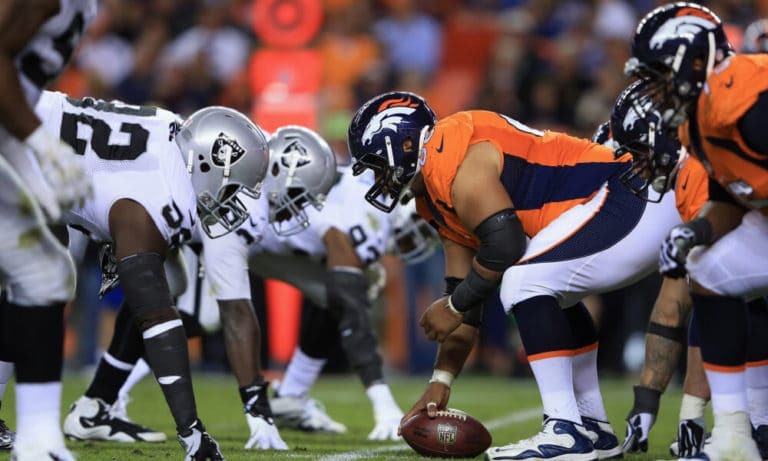 This Monday night’s NFL matchup on ESPN is between the two AFC West teams not headed to the playoffs with the 6-8 Denver Broncos on the road against the 3-11 Oakland Raiders. This Monday night’s NFL matchup on ESPN is between the two AFC West teams not headed to the playoffs with the 6-8 Denver Broncos on the road against the 3-11 Oakland Raiders. Game time out on the West Coast is set for 8:15 p.m. (ET). Denver won its first two games of the season, including a tight 20-19 win at home against Oakland as a six-point favorite. During a three-game winning streak in November, it beat the Los Angeles Chargers and the Pittsburgh Steelers as an underdog. In between those two runs, the Broncos lost six of seven games and with recent meltdowns against San Francisco on the road and Cleveland at home last Sunday, their playoff hopes came to an end. Their record against the spread over those first 14 games is 6-7-1 with the total staying UNDER in their last seven outings. The Broncos turned to Case Keenum as their quarterback and the result was a passing game that is averaging just 229.1 yards per game. He has thrown for 3,396 yards and 15 touchdowns against 12 interceptions with eight fumbles added to the mix. One bright spot on an offense that is averaging 21.9 points per game is running back Phillip Lindsay with 991 rushing yards and nine scoring runs. The Raiders came into this season with hopes of returning to the playoffs with Jon Gruden back as head coach, but a straight-up 0-3 start was a sign of things to come. The highlight reel includes a stunning 24-21 upset against Pittsburgh in Week 14 as heavy 10-point home underdogs, but that is about it in what has been one dismal performance after another. Oakland added two more covers than SU wins to go 5-9 ATS and the total has gone OVER BetAnySports’ closing line in four of its last five games. Derek Carr took the majority of the snaps at quarterback for the Raiders and he has thrown for 3,697 yards and 19 touchdowns with eight interceptions and nine lost fumbles. This was a one of the reasons that the offense that is averaging just 18.6 PPG. The defense should get its fair share of the blame for this lost season after allowing an average of 29.9 points to Oakland’s opponents. Even though there is nothing on the line for either team on Monday night, this is still a divisional battle between teams that do not like one another. My lean is that Denver pulls off the SU season sweep while covering the spread this time around.